Ontario couple Ron Savoie and Adrienne Kenney’s story is one that closely resembles many a person from the upper parts of our North American continent who have sojorned down to the warmer reaches of Central America, Mexico or the Caribbean: one taste of the heat and flavor and they were hooked. 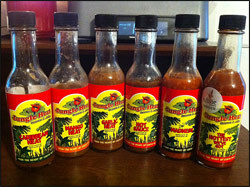 In Ron and Adrienne’s case, Costa Rica was the geographic destination that enthralled them; and long story short, they have a full product line under the name of Jungle Heat Imports that include BBQ sauces, hot sauces and snacks. Earlier this year they had submitted six of their gluten-free spicy sauces for me to sample of and review, and it’s taken me a while to put each product through its proper paces. Finally below I present a summary of my findings for each one. Enjoy!